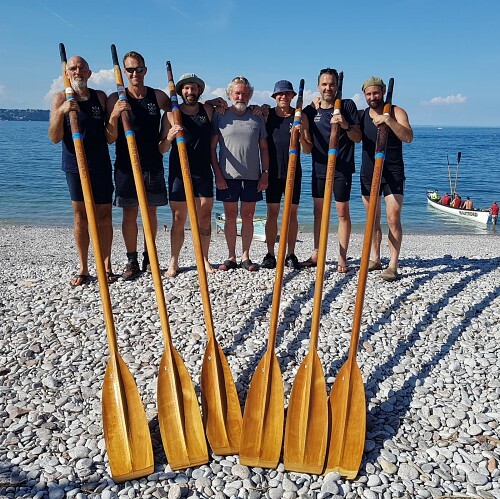 Lyme Regis Gig Club shook up the gig rowing community with a landmark victory in the CPGA Men’s Veteran Championships on Sunday, becoming the first non-Cornish crew to win a CPGA major championships. This year’s event, hosted by Brixham gig club saw 15 mens and 18 ladies crews compete, including the elite crews and winners from the recent competitions on the Isles of Scilly. The CPGA Vets Championships is the governing bodies main annual competition for over 40’s gig rowers. The racing entailed three rounds of racing, with the top crews eventually making the grand final in the afternoon. Lyme were drawn against some strong crews in the first round, including favourites Caradon, unbeaten in major races for the last three years. Lyme made a strong start from the inside lane and within 2 minutes were edging ahead of Caradon. Lyme took the first buoy turn just ahead and held off Caradon who came in a close second. Lyme were pleased to have posted the fastest time of the first round, but harder times lay ahead. Into round two, Lyme were drawn in the middle lane (a hard position), up against the experienced crews from Cattewater, Mevagissey and Teign. Lyme know they had to draw ahead of the competition before the first turn to stand a chance, and with disciplined powerful rowing they did just that, pulling just ahead of Cattewater to take the first turn. Cattewater pushed Lyme hard all the way, but Lyme held them off to win the semi-final. The fastest time in the semis came from the other heat, with the powerful Dart crew coming in quickest. The line up for the final was daunting; Lyme, Caradon, Dart, Cattewater and Appledore. But with two wins in the heats under their belt Lyme knew they were in with a chance. Lyme went through their pre-race routines and lined up for the start as ready as they could be. Again drawn in lane one Lyme knew that with a good start they could dictate the race, however they immediately found themselves well down in the other crews, but piece by piece they draw back on the others, half way to the first turn were vying for the lead with Dart. This was where that inside line came into Lyme’s advantage, Lyme turned perfectly and gaining water, but Dart were coming back, as were Cardadon on the inside line. Lyme pushed incredibly hard on the second leg getting to the next turn with the narrowest of leads. The final leg was a 600m straight drive to the line, Lyme knowing they would need to draw every last ounce of energy to hold off Dart and Caradon. They infact draw further ahead, finally winning by four boat lengths to become CPGA Vets Champions 2018. Caradon were 2nd, Dart 3rd. The crew were; Cam Short, Nick Waite, Tony Ford, Dan Wilkinson, Toby Newson and Ben Short, coxed brilliantly by Tony Short.